The instructions for the pendant are listed separately, so be sure to visit that page first, if you are going to include it. 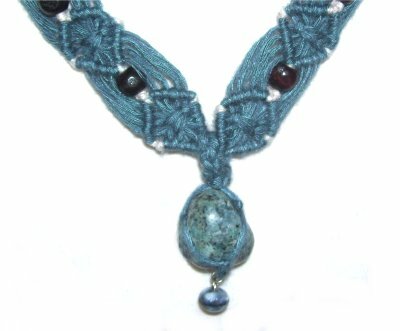 This Macrame necklace does not have a clasp; it is passed over the head. For that reason, you need to make it longer than you normally would. Usually 28 to 30 inches is enough. 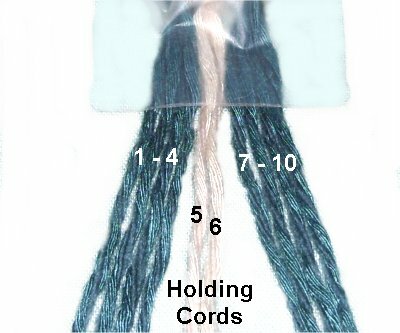 In the example shown, a different color was used for the holding cords, to add a unique touch. This is what caused the lighter color you see at the points of each diamond shape. Beads were used to lengthen the area between the diamonds. 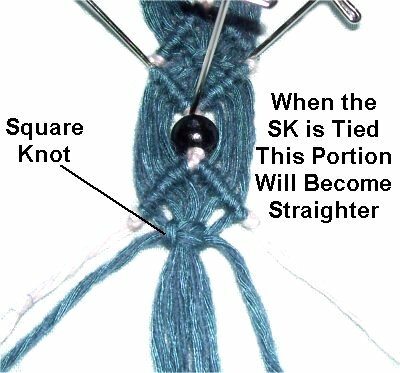 Within each diamond is a Square Knot, which can be changed. See Vintage Diamonds for ideas. The Vintage Bracelet is similar to this necklace design. So you can make both for matched set. Both were made using Bamboo yarn. 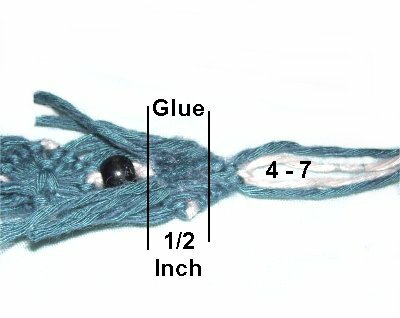 Prepare the ends with glue to prevent unraveling. Step 1: Arrange the cords vertically on your project board. The two holding cords are in the middle, with four working cords to the right and left. 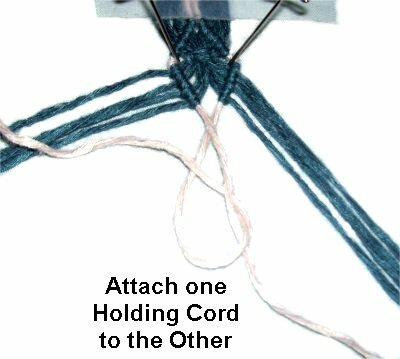 Place a piece of tape across the cords to mark the center, and secure the upper portion. Mentally number the cords 1 - 10. Step 2: Move holding cords 5 and 6 to the left and right. Secure them on a wide angle, making sure they are taut. Attach cords 4 - 1 to holding cord 5, in that order. 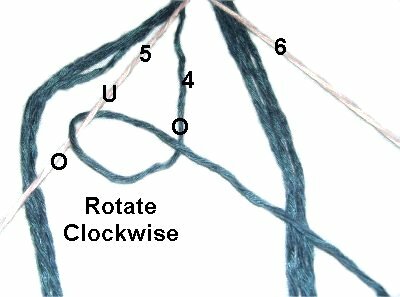 Rotate clockwise as you tie the knots. Step 3: Attach cords 7 - 10 to holding cord 6, with DHH. 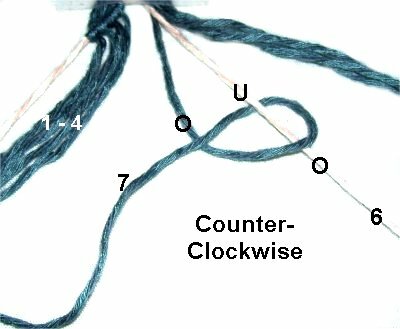 Rotate counter-clockwise. 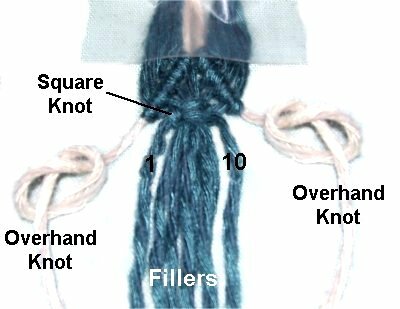 Tie an Overhand knot in each holding cord. Push them against the rows of DHH, before tightening. Step 4: Tie a Square Knot with cords 1 and 10, around the other working cords, which are fillers. 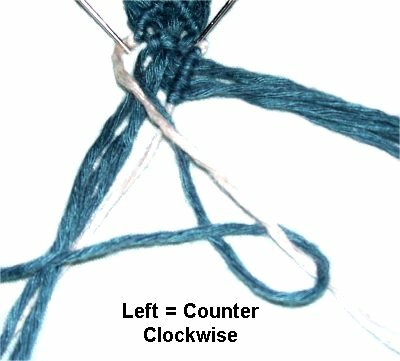 It should line up with the Overhand knots. Step 5: Place pins next to the Overhand knots, so the holding cords go around them. This keeps the corners sharp. Move holding cord 6 towards the center of the diamond. Attach cords 10 - 7 to it with DHH (clockwise). Step 6: Move holding cord 5 towards the center. Attach cords 1 - 4 to it with DHH. 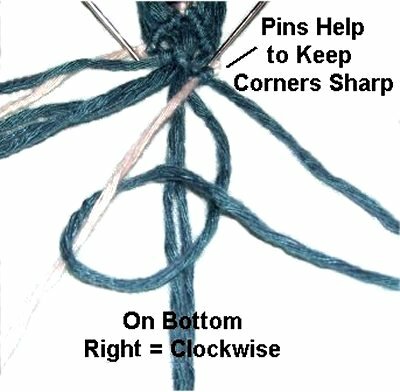 These knots are made in a counter-clockwise direction. Step 7: To complete the first diamond for your Vintage Necklace, you need to attach one holding cord to the other, with a DHH. Step 8: Before you start the next diamond, add 1 bead to both holding cords, sliding it up to the knot made in the last step. Step 9: Move the holding cords to the right and left again, with a wide angle. Repeat steps 2 and 3 to make the top of the next diamond. Repeat step 4. When the SK is tied, the diamond will become more narrow. 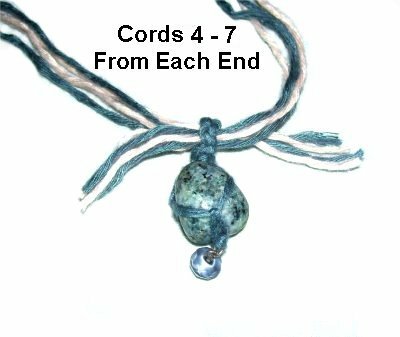 This will straighten the area of the cords surrounding the bead. Repeat steps 5 - 7 to complete the bottom of the new diamond. Step 10: Repeat steps 8 and 9 several more times, until the Vintage Necklace is 1/2 the size you want. So for a 28-inch necklace, stop at 14 inches. Step 11: Turn the Vintage Necklace around, starting at the center again. 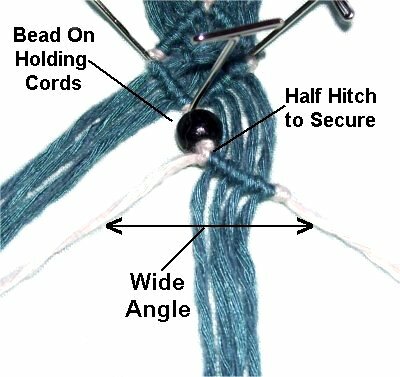 Complete the diamond in the center by tying a DHH with one holding cord onto the other. Repeat steps 8 - 10 several times, creating more diamonds and adding beads between each one. Stop when the necklace is the correct size. Important: Hold the ends together and check to see if the necklace fits over your head easily. Add extra diamonds on both halves if needed. Step 12: Move cords 1 - 3 and 8 - 10 (from one end) to the back of the design. Apply glue under them, as well as on top, for at least 1/2-inch. When the glue is dry, cut off the extra material. Step 12, continued: Repeat the same finishing process at the other end of the Vintage Necklace. Step 13: Did you make your Stone Cradle yet? Now's the time to do so, or you can use a different type of pendant. The loop or ring at the top needs to be sideways, so the cords can pass through it horizontally. Arrange the Vintage Necklace into an oval shape, making sure it's not twisted. Pass cords 4 - 7, from the left end, through the loop on the pendant left to right. Do the same with cords 4 - 7 on the right, passing them through the loop from right to left. Pull the ends so the pendant is resting next to the last diamonds tied at both ends. Step 15: Tie a tight Overhand knot in the back of the clasp, using one cord from each side of the loop. 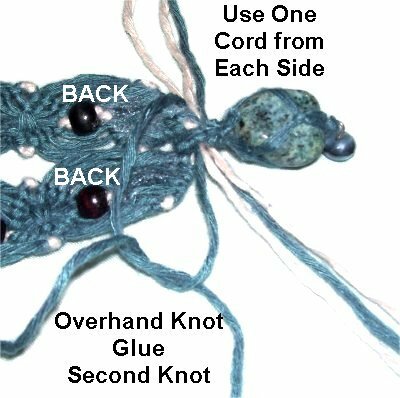 Apply glue on the first knot, then tie a second one. Repeat with the other cords. When the glue is dry, cut off the extra material. Have any comments about the Vintage Necklace? Contact Me.